Warm up Wednesday at Second Cup! 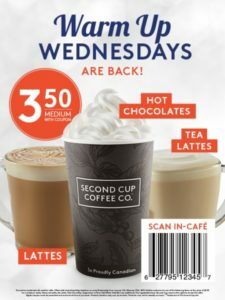 Home » Coupons » Warm up Wednesday at Second Cup! Warm Up Wednesdays are Back! Enjoy any medium Latte, Tea Latte, Hot Chocolate or Flat White for only $3.50! Offer valid at participating locations on every Wednesday from January 9th to February 27th, 2019. Barcode must be presented and scanned at time of purchase.